The nation is observing the ‘Genocide Day’ today for the third time in remembrance of the brutality carried out by Pakistani Army on the unarmed Bengalis on the black night of Mar 25 in 1971. The genocide carried out by Pakistani occupation forces on Mar 25 is a black chapter not only in the history of the Bangladesh but also in the history of world humanity. Pakistani occupation forces just wanted to stop the movement of the freedom-loving people. The then Pakistani President Yahya Khan had assembled troops in the East Pakistan and left for Pakistan secretly on Mar 25, 1971 after giving order for carrying out genocide in the name of ‘Operation Searchlight’. From that night (Mar 25), Pakistani occupation forces along with their local collaborators including Rajakar, and Al Shams killed 30 lakh people in the next nine months, she said, adding two lakh women were violated. President Md. Abdul Hamid and Prime Minister Sheikh Hasina issued separate messages on the eve of the ‘Genocide Day’, local media reported. The Bangladesh Awami League government has decided to observe the day as ‘Genocide Day’, Sheikh Hasina said, adding, “We have taken all-out initiatives to get international recognition of genocide carried out in Bangladesh in 1971”. To mark the day, the country is set to stage a one-minute blackout from 9 p.m. to 9.01 p.m. on Mar 25 recalling the horror of the Mar 25, 1971 black night when the Pakistanis launched genocide on Bangladesh soil. Newspapers published special supplements and television channels are airing special programmes highlighting the significance of the day. Special Munazat will be offered at all the mosques and other religious institutions, seeking eternal peace of martyrs who were killed on Mar 25, 1971. In observance of the day, Centre for Genocide Studies (CGS) of Dhaka University is organizing a two-day international conference titled ‘Genocide and Mass Violence’ at the Muzaffar Ahmed Chowdhury Auditorium on the campus from yesterday that will end today. 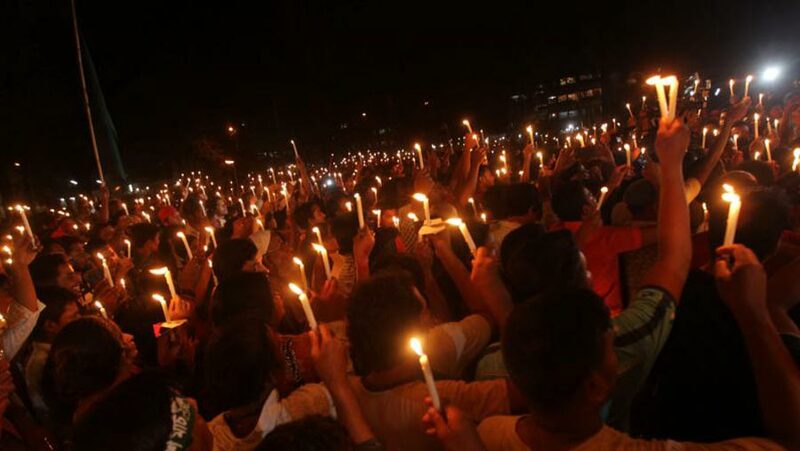 The Forum for Secular Bangladesh and Trial of War Criminals of 1971 will bring out a torch procession from the central Shaheed Minar premises at 8:00 p.m. today. On the black night of Mar 25, 1971, the Pakistani military junta carried out mass killing in Dhaka as part of their blueprint to thwart the Awami League’s assumption of office following the victory in the elections held in 1970. The Jatiyo Sangsad unanimously adopted a resolution to observe the Mar 25 as the “Gonohotya Dibos” (Genocide Day) on Mar 11, 2017. Subsequently, the cabinet division in a meeting with Prime Minister Sheikh Hasina in the chair, unanimously endorsed the decision on Mar 20 in 2017.